Biden sat down for an interview with Yahoo News senior correspondent Jon Ward in 2015 when he was thinking about running for president. Unprovoked, he brought up Warren, who was then being floated as another potential candidate. He repeatedly contrasted his views with Warren's, holding himself out as pursuing "common sense." While he acknowledged she was "smart as hell and a good person," he said her fundamental goal was "punishing the rich" versus "helping the poor and working class." While Biden wanted Warren to be his running mate in 2016, according to people familiar with the situation who spoke to Politico, friction between the pair dates back at least to 2002. In May of that year, Warren criticized Biden in a New York Times op-ed for his support of a bill that intended to make it more difficult for consumers to declare bankruptcy. Warren, who was a Harvard University law professor at the time, published an op-ed titled, "A Quiet Attack on Women." "Banking and credit lobbyists have been trying to change the bankruptcy laws for years," Warren wrote. "The current bill was stuck in conference between the Senate and House until Senator Joseph Biden of Delaware — where many banks and credit-card issuers are incorporated — agreed to vote with Republicans on almost all the issues that were holding up the bill." 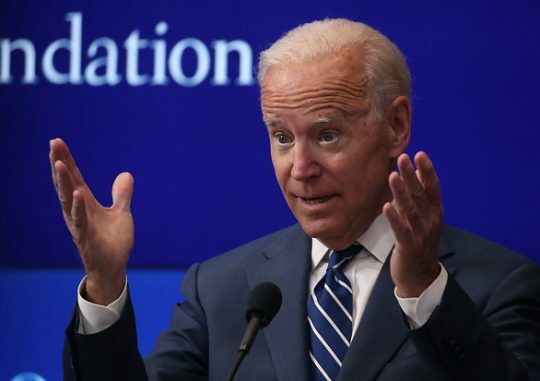 Biden referenced Warren's critique during the 2015 Yahoo interview, saying, "The credit card change we made, that alone has saved consumers over $20 billion a year." He went on to say that he "came up with a pragmatic, but fundamental, change in the way credit card companies could operate." Warren was asked during the Washington Ideas Forum in 2015 whether she and Biden clashed in the past about financial reform, prompting her to say, "Oh yes we have. You bet." She added, "You better believe I didn't hold back." Warren announced on New Years Eve she was forming an exploratory committee to run for the 2020 Democratic nomination. Biden, meanwhile, told CNN earlier this month that he would make a decision on whether to run "soon." Biden leads national polling among Democrats and enjoys popularity within the party after serving two terms as Barack Obama's vice president. This entry was posted in Politics and tagged 2020 Election, Bankruptcy, Elizabeth Warren, Financial Industry, Joe Biden. Bookmark the permalink.